If there’s one thing Shoreditch probably doesn’t need it’s another Vietnamese Street Food restaurant. Head over to the Kingsland Road and you can have your pick of restaurants, or stand on the Old Street/Curtain Road cross road and turn your head right to find Cay Tre, or left to see Banh Mi. Or look slightly ahead for Korean On the Bab or generic Thai Busaba. 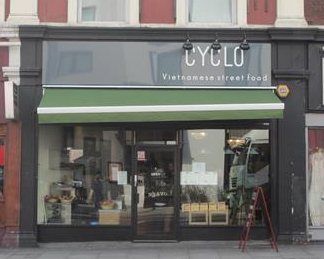 Last week I popped after work to Cyclo (which, if you are at the Liverpool St end of Shoreditch saves you at least 10 minutes of walking to the Kingsland Road) for a quick bite to eat. Street food during the day (Banh mi, baguettes – not so clean so avoid for lunch…), it turns a la carte come evening. It was pretty packed when we turned up; mainly 20 something Shoreditch types, with a few probably-tinder-dates going on. It’s a good menu, nothing out of the ordinary with all the flavours and combos you’d expect. I opted for prawn summer rolls, chicken lemongrass, pak choi and chinese broccoli with garlic sauce. This is why I love Asian food – all that deliciousness, and still clean and healthy! The chicken gives me my hit of protein too! The food was yummy; full of soft subtle flavours that peeked through as you ate. I was happy. Service wasn’t fab so be prepared to have to wave and speak up to get their attention. Delicious? Yes, but I’d still go to Viet Hoa or On the Bab first. Why should I go there? Quick bite to eat after work.